and get outside of the Box. Simcoe County's only 'outdoor' fitness centre. Year round classes for all fitness levels including Yoga, SUP, Fitness Bootcamps and SUP Yoga. Well-socialized dogs are welcome and always free to our Canine Bootcamps! Owner of Balance4Wellness Consulting, Cayra DeLuna has been involved in the fitness and wellness field for over 28 years in various capacities including professional athlete, coach, programmer, facility manager, recreation consultant, yoga instructor and personal trainer. In addition to proactively trying to save lives by helping individuals make positive fitness choices through B4W, Cayra is a paramedic where she works to save the lives of individuals experiencing medical or traumatic emergencies within the County of Simcoe. 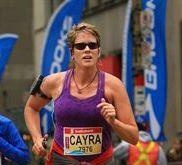 Cayra has her Bachelor of Physical and Health Education from University of Toronto. Her certifications include SPRA Individual Strength Training and Active Older Adult Certifications, YMCA Individual and Group Conditioning certifications, and 300hr Registered Yoga Teacher. She is a member of the Canadian Fitness Professionals where she holds her Personal Trainer Certification and Nutrition/Wellness Specialist Certification.